DONETSK, August 05. /ITAR-TASS/. Self-defense fighters are deterring an advance of a large Ukrainian army force in west Donetsk, the local news agency Novorossiya reported on Tuesday. The Ukrainian “punitive force is actively trying to breach our defense, which has not been seen for a long time before. We are currently successfully repelling the attack. 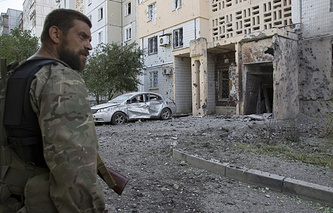 The settlements of Krasnogorovka and Maryinka are remaining under our control,” the agency reported. The agency report said that the Ukrainian grouping in south Donetsk was building up its forces, bringing the armor to the area. “Everything is calm in the east of the city after a unit of the [Ukrainian] 25th air mobile brigade has been crushed. The Ukrainian military is probably afraid of moving in here and is delivering long-distance artillery strikes,” the news agency said. Heavy battles are continuing near Shakhtyorsk. 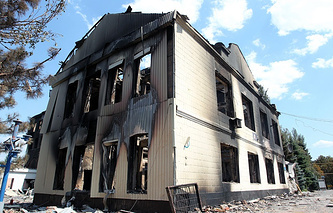 Self-defense fighters have been able to successfully repel the attacks by the Ukrainian military, the news agency said. “Saur-Mogila remains under our control,” the agency said. “Our forces have inflicted heavy damage on the enemy in the north, in the area of Debaltsevo and Komissarovka. The command of the military operation spoke loudly about a mopping-up operation in Donetsk but they [the Ukrainian military] have not even been able to enter the city and the settlement of Yasinovataya [near Donetsk] also remains under our control,” the news agency said. A total of 438 Ukrainian army soldiers were forced to cross into Russia on Monday, leaving over 60 pieces of the armor to self-defense fighters to save their lives. “About 60 pieces of the armor, material supplies and all weapons have been transferred to self-defense fighters,” the militia of the Donetsk People’s Republic said in its report. 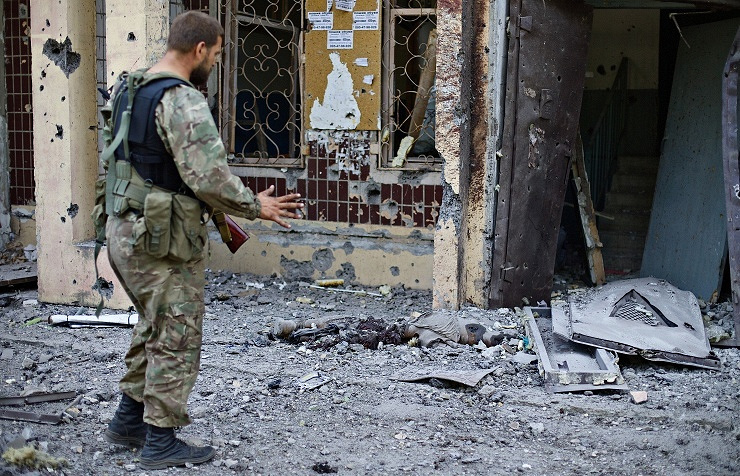 Our forces have inflicted heavy damage on the enemy in the north, in the area of Debaltsevo and Komissarovka. The command of the military operation spoke loudly about a mopping-up operation in Donetsk but they [the Ukrainian military] have not even been able to enter the city and the settlement of Yasinovataya [near Donetsk] also remains under our control	the news agency Novorossia The self-defense militia inflicted damage on the Ukrainian military on the north-eastern outskirts of the town of Shakhtyorsk near Donetsk on Monday, the headquarters of the Donetsk People’s Republic said on Tuesday. “The first and second Slavic battalions and the Kalmius special battalion enjoying the support of a combined artillery battalion destroyed at least three pieces of the armor, a mortar unit, a self-propelled artillery gun and an artillery correction team of the Ukrainian military,” the militia headquarters said. Updated information has been received about the militia’s artillery strike against the enemy positions near the settlement of Metallist, the headquarters said. “Our fire has destroyed a warehouse of phosphorus ammunition, one tank and one armed personnel carrier, as well as 25 enemy soldiers who were killed mostly by the warehouse explosion,” the headquarters said. A large number of the Ukrainian army’s tanks and mechanized infantry attacked the settlement of Dmitrovka south of the town of Snezhnoye in the first half of the day on Monday, seeking to break through to the grouping surrounded by self-defense fighters in the settlement of Dyakovka, the militia headquarters said. “The militia’s anti-tank guided missile fire has destroyed three enemy tanks and one APC. After this, the enemy attack force tried to bypass the militia’s positons via the settlement of Kozhevnya but was repelled by artillery fire. Most of the enemy armor and motor vehicles had been destroyed by the evening,” the militia headquarters said. Also, the Ukrainian National Guard launched several attacks on self-defense fighters with the support of tanks in the area of the settlement of Maryinka west of Donetsk, the militia headquarters said. “The enemy has lost up to a platoon of soldiers both killed and wounded. The militia has destroyed three tanks, one infantry fighting vehicle and a truck with ammunition. Currently, the enemy is concentrating large National Guard forces on the southern outskirts of Donetsk,” the militia headquarters said. Pro-Kiev troops and local militias in the eastern Ukrainian Donetsk and Luhansk regions are involved in fierce clashes as the Ukrainian armed forces are conducting a military operation to regain control over the breakaway regions, which on May 11 proclaimed their independence at local referendums. During the military operation, Kiev has used armored vehicles, heavy artillery and attack aviation. Many buildings have been destroyed and tens of thousands of people have had to flee Ukraine’s embattled east.